We’ve seen various guitar and mic stand-mountable pick holders, but Picktape promises to be the easiest way to get hold of your plec in a hurry. Specially designed to not damage or leave residue on picks or guitars, PickTape features a light adhesive strip just strong enough to hold plecs in place, but without making them feel sticky. 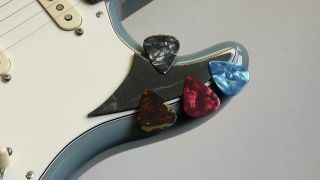 Each double-cut-shaped strip holds multiple picks of any kind, and could prove handy for guitarists seeking to switch between picking and fingerpicking mid-strum. PickTape is available now from the company’s website, with packs of four starting at £3.99.